Green PB210, red Sunny excelent , from Japan. I LIke the green color car... but if the green car would have the red cars' tail light and rims would make it look PERFECT!!!! Hmm, wonder why he's selling? put 2getha the best of both...and ya'd have a pretty sweet hybrid "WHY"
That green coupe looks fat! I prefer the normal tailights (for Australia anyway), like the green car's. I prefer the Excellent rear, Looks like a mini GTR with the round lights. Both cars are fine examples of the datto art form! Agree with everybody , both are good examples, different in their own way, I like both, probably inclined to the excelent round tail, but I like both. About the green one, I E/mailed Masayuki and he corrected the information, his' is a B210GX, not a PB. PB 210's came all with L series motors. Sunny excelent 1400 and 1600 are also technically PB210's, all "L" series engined cars. 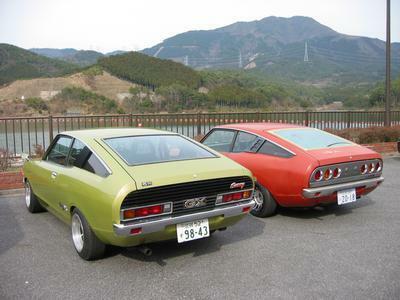 The B210 in Japan came with A series and sometimes with "L" series, either or, while the PB210 , as well as the Sunny Excelent , is exclusively "L" series Datsun, either "L" 14 or "L" 16 motored. Minor detail, Dgonz asked me once about that, and forgot to post the response from Japan. That GX is awesome. Actually I will have to get some photos of a mates 120Y sedan, A15/5 speed/Dellorto 40s on rechromed jellybeans. it is really nice especially with the chrome front grill, really makes it look mean. I like the greens angled rear pillar support but thats it compared to the X. The greens tailights are too tacky and out of place with the rest of the car hence its bad reputation and that GX badge is like the toyota writing on their Utes just too much. If more Ys had those round tailights there would be more saved Ys rather than being crushed like beers cans. The Excelent gets my vote. I like the lights, & i like the colour. Combine the best of both? Good idea, but what does the GX have that the Excelent would benefit from i wonder? Also, I like the Hayashi's better. I found more information on the "210" Excellents. The 1975 Sunny Excellent 1400 (L14) was a PB210, but the 76-77 Sunny Excellent 1600 (L16) wasn't! 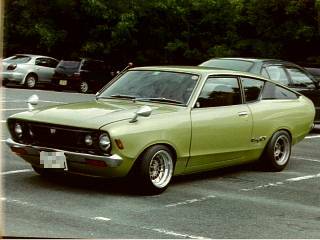 In other words, it appears that Nissan stopped making a separate model line (PB210) for the Excellents and instead made them a B210 model trim.